Happy Hannukah, Merry Christmas, Happy New Year, and let’s not forget about Festivus. I guess that covers everything. I’m writing this at 10 PM on the so-called “Black Friday,” so you can see how seriously I take that date. All the instruments and bows that we sell here are backed up by years of experience in setting up and repairing these wonderful tools of music making. I won’t compromise in the quality of what we sell for a quick buck, so don’t look for “something for nothing” here. Every instrument that goes out the door has a little bit of me in it and every bow that Michael Hattala restores and rehairs shows his reflection in the quality of his work. This is 365 days a year. none of them black. This is not to say that we don’t have some bargains! It’s just that they are available year round. I’ve left the copy from the last 2 years below (with some revisions, like stuff we don’t have any more), so you can see some of the special purchases I made that allow you to obtain first class instruments and bows for a little less than normal. The special prices from June are still in effect, and every outfit includes a FOM shoulder rest at no extra charge. Recently I was able to obtain some excellent violins from Krutz Instruments. They are not the usual Krutz product, but they were made in the same factory in Beijing for another wholesaler. The original customer backed out of the deal and the Krutz representative was there at the right time to snag around 400 violins of varying grades. I bought 10 of the highest grade, featuring marvelous flamed maple and fine workmanship throughout. The price is $599. Sound is outstanding. Photo to come as soon as I find the time. My supplier of the Zhong Long Sheng instruments has a less expensive line with the trade name “Novizio.” Where that name came from I don’t know—she must have been buying a TV or something and only would settle for a Sony. Anyway, after a couple of years searching out the right makers the results are terrific. I bought the lowest grade, and they sell for $1000. Unbelievable sound and appearance for the money. The carbon bow competition has a new contender. The most nagging problem with less expensive carbon bows, or inexpensive bows in general, is the failure of the original installation of the hair at the frog. Beneath the long piece of mother pearl (which slides out), a properly made frog has a mortise (a rectangular hole) with one end beveled downward making it longer at the bottom than at the top. The hair, properly tied at the end with a long not, is secured with a wood plug that is the same shape as the mortise, albeit shorter. The bevel locks the hair in place. No glue is used in this process. Many lesser quality bows feature frogs with a simple round or oval shaped hole with no bevel, an ill fitting plug, badly tied hair, and a load of white glue to make up for the various discrepancies. Guess what? Lots of them fail, and I have had to raise the price of many of these bows to include the first rehairing of the bow as part of the price of the bow (within one year of purchase). This policy does not instill confidence in the seller. Now Echo Bridge Instruments has found a maker who swears that his bows are haired the right way. With the first shipment I received I tore apart one of the frogs and found it to be properly haired. These are the Velocity bows, and we have toe first 2 grades, the Journey priced at $125.00 and the Voyager priced at $175.00. These bows, and the Glasser X- Series bow at $95.00 (never a hair problem with those) are the 3 carbon bows we offer below $200.00. The end of the school year often heralds the beginning of the search for a larger or better quality instrument. Over the last year I have purchased over 100 violins, violas and cellos with this time of the year in mind. Described on the “Intermediate and Advanced” page (and below) is the Cedar Music violin. 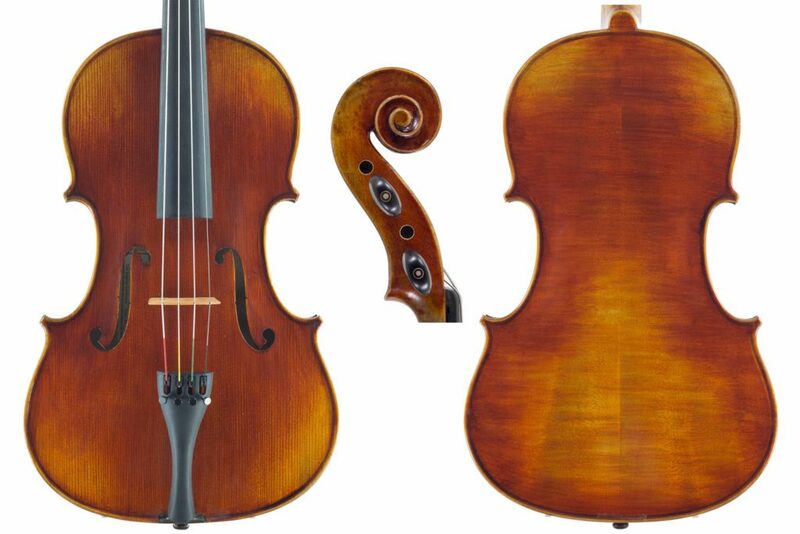 This month we are offering the violin for $549.00! Also included at no charge is a FOM shoulder rest (a clone of a popular $35 collapsible rest), a $15 value. Remember, that Bobelock cases are discounted by $15 or more when you purchase then with an instrument. Glasser bows are included at $40, and the new Velocity Journey bow can also be had at a reduced price that I can’t advertise online. I just obtained a number of Century Strings violins at a special price which I am passing on to you. The reason for this price is that the Century Strings workshop has slightly changed the instruments, and a few hundred of the older models have had their prices reduced. The following models are available: 220 (normally $600) $549.00; 320 (normally $800) $699.00, 420 (normally $1000) $899.00. Remember–these are all set up by me–no “factory” setups leave this shop. I still have lots of the Eastman mod. 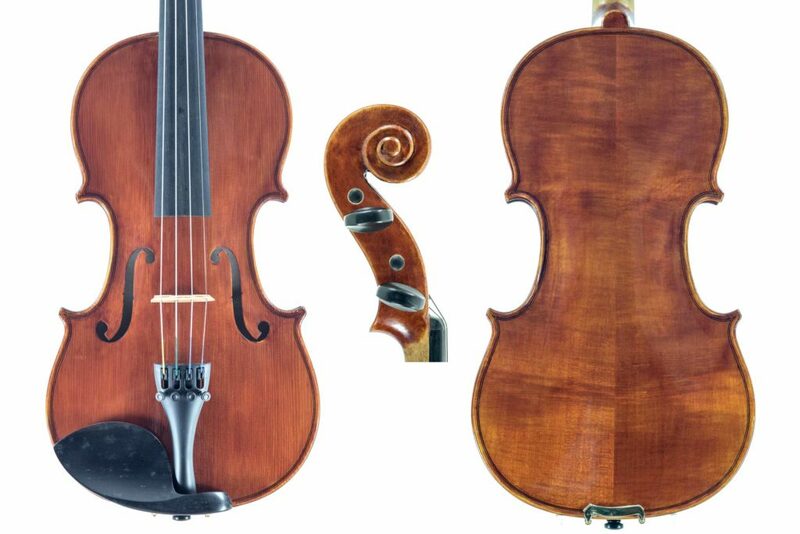 120 violins, described below, priced mostly in the $500 to $800 range. There are many Bobelock mod. 1047 (normally $195) half moon cases priced at $175.00; mod. 4002 rectangular cases (normally $225) priced at $190; and remember that that price is reduced when you buy a violin outfit. If you click on these images they get REALLY BIG. This is our newest entry level violin. It’s a simple instrument with the top and back entirely arched and graduated by a computer controlled milling machine. 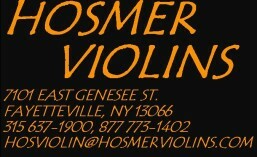 This technique produces great consistency of sound and playability, and, of course, it receives professional setup and adjustment at Hosmer Violins. The violin alone is $400. Cases start at $65, and bows at $40. Rosalia wide body violas. 15, 15 1/2, 16, and 16 1/2 sizes. These instruments just have simpler and less flamed wood than the higher grade Paolo Lorenzo instruments that sell for $1200, otherwise they are the same body shape. We have found these violas to be the best sounding instruments for the price anywhere, and this is the first time they have produced them in the wide body style. You can find them for less on the internet (with the less-than-stellar factory setup), but they are not adjusted to the level that you will find here with a custom fitted bridge of the proper width and Dominant strings. Price is $800. In my September entry, which you can read below, I described how I acquired these violins. They are turning out to be real winners. It’s amazing to see the consistency of the workmanship, finishing and sound. I have about 20 left, and there won’t be any more. We had a big run on cellos in the fall, so I went nuts buying more cellos. There are some new additions from Eastman Strings (Albert Nebel), Tanglewood Strings (Hua Chan Jun and Jian Ming Li), Amber Strings (Novizio and Zhong Long Sheng), and the workshop of Deng Yan Shan. We were also lucky to obtain more of our entry level Xuechang Sun cellos; since they had to move their factory production was interrupted. Cellos are priced from $1200 to $4000. There are lots of other great violins, violas, cellos, bows, cases and accessories. The owner of Eastman Strings was able to buy about 300 violins from a friend of his who was closing his shop. They all went through the Eastman workshop for fingerboard dressing and quality ebony pegs, and I was able to snare 25 of them. They are in a few different grades, all designated “Eastman mod. 120, priced from $400 to $800, and they all have properly sized necks. The owner’s daughter showed up in her big white truck, and I picked out some Pietro Lombardi violins, priced at $2000 and Pierre Lupot’s at $1500. Also arriving and sold immediately was an Albert Nebel cello, made with all European wood, selling at $4000. Below $1000 there are many choices, starting at $400 with the new offering from Century Strings. These violins are made in their own workshop in Beijing, and the tops and backs are mostly arched and graduated by CNC machines, thus keeping the price down while producing a great sounding violin for the money. My latest score are the violins from Cedar Strings, the workshop of Zhenjie Zhao. Mr. Zhao and his wife and daughter (the only English speaker) showed up here about a month ago with a car load of instruments. I was very impressed with his $800 to $2000 range violins, and a bought a number of them. Then Huijuan, the daughter, asked if I wanted to see any “rental” grade instruments. I reluctantly said yes, and am I glad I did. She pulled out a beautiful violin that was anything but “rental” grade. Turns out that these instruments were made 5 years ago and varnished with a shaded orange finish that they no longer use. Otherwise, they are roughly the same caliber of instrument as their current antiqued violin selling for $800. I bought 6, and later that day I set one up. Then I called her and asked “how many more of these do you have?” Of the 40 remaining, I split the number with a shop in Maryland, and now I have 23 left (3 were sold). It’s simply the best $600 violin I have ever had. Violas have been very popular lately, so I was very happy when the West Coast Strings white truck rolled in. 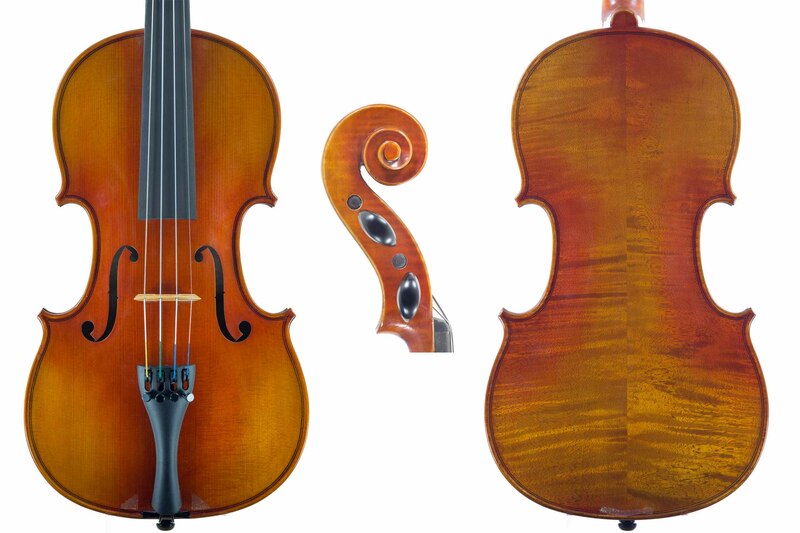 A number of Paolo Lorenzo wide body violas now line the walls, in sizes from 15″ to 16 1/2″. These instruments are available in a number of different grades, priced up to $3000, but I have found that the Paolo Lorenzo is the best combination of price vs. sound at a mere $1200. Hopefully I will also be able to get a number of Xuechang Sun violas in all sizes. Mr Sun had to move his factory because of some government hijinks, so he’s a little behind in production. Let’s not forget about cellos! Gang Shen from Tanglewood Strings pulled in with his white truck, and I bought some more cellos from the workshop of Hua Chang Jun. They have been a $2000 staple for the last 5 or 6 years, and they keep getting better. Jian Ming Li, the supplier of one of my $600 violins, is getting into the cello business, and I obtained two examples, priced at $1500 and $2800. I bought 4 of my regular $1200 Xuechang Sun cellos a few weeks ago, but they are mostly gone. More are arriving next week, along with 4 cellos from Deng Yan Shan (I haven’t priced these yet because I may have to install pegs–I don’t know if they have them fitted). Also coming is a cello from C.L. Wynn, a higher grade instrument priced at $3000. For some unknown reason, cellos have been flying out the door recently. The bows from Brazil are still well represented with examples from Arcos Brasil, Horst John, and Buzzato Bows, priced from $350 to $800. Carbon bows from Glasser and China range from $100 to $450, and there are a number of vintage bows from $500. I don’t have to remind you that all of the instruments I sell, no matter how inexpensive, are set up by me. In fact, it seems the cheaper the instrument, the more I have to do to it to make it fit to be sold here. You won’t get instruments set up like this from the internet or from dealers who sell orchestral instruments only as a sideline. Please impart this to your students and to their parents. Buying a violin is not like buying an IPad. The internet is not your friend, and it certainly isn’t mine. When you shop for an item like a violin, where functionality is chief among many other important factors, there is only one logical choice–BUY LOCAL, and buy from a specialist. Of course, you can buy entry level outfits for a couple of hundred dollars online or from music stores, but they are not the quality that you deserve, and certainly not the quality that I expect. (My opinion: European entry instruments, although well made, are unacceptable because they are too heavy and do not sound well.) Have you already bought a bargain online? If it meets certain parameters of quality, it makes sense for you to have it professionally set up. I’ll be happy to give you an estimate. All the instruments I sell are set up by me to my exacting standards. You will only find quality Pirastro, Thomastik, or D’Addario strings, the necks are smooth, the playing action is easy, the pegs work well, and I will not sell instruments that don’t sound the very best for their price points. Entry level instruments receive the same care as the $2000 ones. If you have a problem with any instrument I have sold it’s unlikely that you will have to pay to have it fixed for the first three years of ownership (basic maintenance and accidental damage excluded). Reliability is probably the most important factor in choosing an instrument at the dealer level, and my 48 years of experience allows me to choose only the best instruments and bows for my clientele–ones that I can stand behind (and cases that I can stand on).